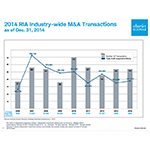 "The steady level of M&A activity we’ve seen over recent years underscores the growth and maturation of the industry"
SAN FRANCISCO--(BUSINESS WIRE)--The merger and acquisition (M&A) market continues on a consistent year-over-year pace, according to the latest data compiled by Schwab Advisor Services, as independent registered investment advisor (RIA) firms thrive and the independent investment advisory model remains one of the fastest-growing segments of the financial-services industry.1 Year-end 2014 data shows deal pace has remained largely consistent, with 54 completed transactions in 2014 matching the total deals completed in 2013. Meanwhile, in 2014 average deal size ticked upward by 9 percent from the previous year, with assets under management (AUM) totaling $47.4 billion, versus $43.6 billion, respectively. Buyer types in M&A deals have also remained consistent over the past two years, with Strategic Acquiring Firms (SAF) and RIAs representing the majority of deals. SAFs were the leading buyer category in the first half of 2014, but RIAs inched ahead by year-end, closing 41 percent of the deals in 2014, compared to 38 percent closed by SAFs. Results from Schwab’s 2014 RIA Benchmarking Study1 indicated that nearly 25 percent of the fastest-growing firms2 are looking to make opportunistic acquisitions to bolster their growth. Achieving scale from organic growth and acquisitions, the fastest growing firms reported three times more growth than the average firm. Schwab Advisor Services reports the findings of its RIA industry M&A research twice yearly (a mid-year and year-end report) as part of a continued commitment to provide advisors with an overview of trends in the RIA space and help inform their decisions when evaluating M&A opportunities. Schwab also offers a consultative approach that helps firms determine their transition options, build a strategic plan to achieve business growth objectives and implement strategies to help firms build scale. Schwab’s M&A research data is compiled and analyzed by Schwab Advisor Services. Schwab’s data reflects transactions involving primarily high net worth and endowment focused RIAs with assets under management exceeding $50 million. The data also includes Advisors-in-Transition who joined an existing RIA and received equity consideration. Schwab does not intend to track all financial-services industry deals or all industry deal types across all channels and the data is not intended to reflect the global landscape of industry transactions or transaction types. © 2015 Charles Schwab & Co., Inc. (Schwab). Member SIPC. All rights reserved. Schwab designed this study to capture insights in the RIA industry, based on survey responses from individual firms. The 2014 study provides information on topics such as asset and revenue growth, sources of new clients, products and pricing, staffing, compensation, marketing, technology and financial performance. The RIA Benchmarking Study comprises self-reported data from advisory firms that custody their assets with Schwab. Schwab did not independently verify the self-reported information. 2 The fastest-growing firms from the RIA Benchmarking Study are the top 20% of firms as determined by net organic growth (2009-2013 net organic CAGR). This cohort includes 108 firms out of 541, all of which have $250 million or more in AUM. This group represents 91% of the total assets of all firms in the Study. Net organic growth—the change in assets from existing clients, new clients, and assets list to client attrition—is the area over which RIAs have most control. Thus, it is the growth metric used for this analysis.